Journalist and author Marc Phillip Yablonka’s Vietnam Bao Chi: Warriors of Word and Film (Casemate, 320 pp., $32.95, hardcover; $11.99, Kindle) provides a different point of view. Yablonka tells the stories of more than thirty Army, Navy, Air Force, Coast Guard, and Marine military correspondents, photographers, and TV and documentary cameramen and directors who covered the war for Stars & Stripes and various military media. Marines, as Yablonka shows, were warriors first and reporters or photographers second. In one case, Yablonka writes of a Marine cameraman, as the next most senior in rank, picking up his M-14 and calling in an airstrike after his lieutenant and sergeant were severely wounded. In another, a Marine journalist captured six Viet Cong. Military abbreviations and jargon pepper the text; the glossary is seven-pages long. Some veterans may find the terms nostalgic; civilian readers may find themselves regularly referring to that glossary. Some chapters recount the war’s “surreal” moments.” In one case, ten Marines on a roof watch flashes in the distance as rockets fall on Da Nang’s airbase, excited by “the fireworks show.” They sit in beach chairs and drink beer. Then someone yells out: “Get naked.” So they did. Another time, after a firefight, a lieutenant had his unit call out their last names to determine if anyone had been killed. One guy didn’t answer. After a frantic search, he was found behind a boulder—calmly eating C-ration fruit cocktail. Vietnam Bao Chi isn’t for everyone because of its repetition and level of detail. But that was the mission of military correspondents: to provide context and details that arguably escaped recognition by civilian reporters. The book’s perspective may be unique among the number of books written about the Vietnam War. It’s not that the photos in We Shot the War: Overseas Weekly in Vietnam (Hoover Institution Press, 214 pp. $49.95, hardcover; $11.99, Kindle), aren’t first rate. They’re really good and provide a clear look at everyday life of American troops in the Vietnam War. That said, the photos are a letdown after the big build-up from the publisher. The Overseas Weekly is described as a trail-blazing, anti-establishment rag that was the GI’s voice: “The least popular publication at the Pentagon,” we’re told. The people who put it together must have been real rabble-rousers. The book’s Foreword tells us that the images used in the book were culled from 20,000 photos in the Hoover Institution Library’s Archives. National Geographic also liked to trumpet how many rolls of film were shot, but I always thought the greatest boast would be getting the greatest number of unforgettable images from the fewest rolls of film. 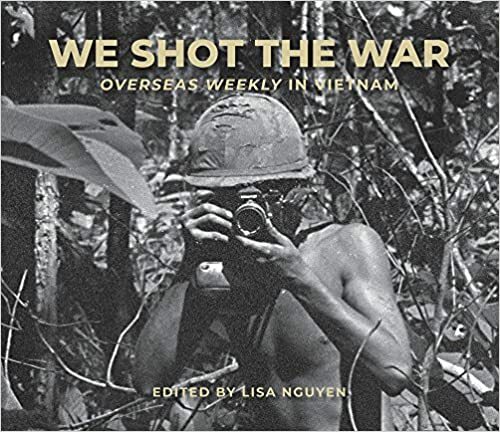 The book is edited by Lisa Nguyen, an archivist who organized an exhibit this summer of Overseas Weekly war photos at the Hoover Institution at Stanford University. The Overseas Weekly was founded in Germany by Stanford graduates in 1950 to cover military affairs in a less-official manner. As the war in Vietnam escalated, a Saigon office was established. A young, Texas journalist, Ann Bryan, its editor-in-chief, was the only female editor in Southeast Asia. The Overseas Weekly irritated the brass by covering such sensitive topics as drug use and racial strife among the troops. It was noted, too, for its “Man in the Street” column, which gave enlisted men the opportunity to sound off—and for running lots of photos of pretty girls. The paper had a small, dedicated staff and a shoestring budget. The first issue went to press in 1966 and by 1970 it was all but washed up. But in that four-year period its writers and photographers (often one and the same) scattered across South Vietnam and Cambodia, documented the war from the GI’s perspective. Unlike better-known media covering the war, its readers were those fighting the war. Subsequently, the coverage became more nuanced, providing a gentler portrayal of the war’s combatants. It wasn’t pandering; it’s because the editor would be called on every error of fact and tone. Reaction was immediate because the audience wasn’t half a world away. David L. Haase is a former journalist who got his start in the business in Vietnam covering the war. After getting tossed out of Vietnam, he went to Laos and spent many months there struggling to learn how to write about war and how to deal with the often extreme discomfort that westerners encounter in hot, humid Southeast Asia. Much space is devoted in his memoir, Hotel Constellation: Notes from America’s Secret War in Laos (C. Lawrence, 280 pp. $16.99, paper; Kindle, $6.99), exploring the serious problems h encountered in Laos. That includes crotch rot, hemorrhoids, and other afflictions brought on by bad water and bad food. Haase was very young when he arrived in Southeast Asia, twenty. His 4-F draft status prevented him from having the opportunity that about 2.8 million other young Americans had serving in South Vietnam in an American military uniform. This memoir is engaging and well-written and more honest than Haase had to be about how callow and inexperienced he was with just about everything. He uses a journal he kept at the time and the long letters home he wrote to loved ones to summon up the small details of his life in Laos that inform his memoir and make it accessible and intimate. I found it fascinating to be with him through his diary entries as he witnessed the destruction of the small, landlocked country of Laos as the CIA used it as the place to stage its so-called “secret” war. Haase evokes the special atmosphere of the Hotel Constellation, the place everyone in Laos eventually stumbled through looking for whatever it was that brought them far away from home to this tiny country that was at the center of the biggest war going. Mark Masse is a professor of literary journalism at Ball State University. His new book, Vietnam Warrior Voices, Life Stories: Caputo, Del Vecchio, Butler, O’Brien (Mark Henry Masse, 94 pp., $5.99, paper; $4.99, Kindle), is a work of literary journalism. It is based on a series of interviews Masse did with the four “warrior voices” of the subtitle. In about seventy pages of text, Masse gives the reader the pith of what these writers have tried to accomplish in their books. He gives the impression that all four have been tormented, angry souls at some time in their lives. Maybe that is a characteristic of most authors who write books that deal with war. War is not a happy subject. I got a good sense of what these men have accomplished in their lives and in their writing careers. Plus, this book would have motivated me to read their books—if I had not already read all of them. I am motivated to reread John Del Vecchio’s novel, The Thirteenth Valley, as I didn’t much like it the first time I read it a long time ago. If I were still teaching a Vietnam War literature course, I would use this book as an introductory text. It would work well for that purpose. I’ve met Bob Butler and Tim O’Brien, and my impression of them and of their work is about the same as Masse’s. So I figure that the portraits he draws of the other two, Del Vecchio and Philip Caputo, are equally accurate. I find myself asking why I’ve not met Caputo or Del Vecchio. I don’t know; maybe I lacked the motivation. Certainly both of them have been out on the road giving talks and signing books—the purgatory of authors who wish to sell books. I suggest buying and reading at least one book by each of these guys—they are worth that much effort. They have all worked hard at their craft and have achieved some notice, even as fame and fortune have—by and large—eluded them. In On the Frontlines of the Television War: A Legendary War Cameraman in Vietnam (Casemate, 304 pp., $32.95; $9.99, Kindle), Yasutsune “Tony” Hirashiki describes his experience in the Vietnam War from 1966 to the communist takeover in 1975 working behind the camera for ABC News. The eyewitness accounts of the many phases of the war in this memoir bring events to life as if they had happened yesterday. In his quest “to become as good as [the famed photojournalist] Robert Capa,” Hirashiki chose to cover the most dangerous assignments in the war. “Many of us dreamed that war reporting would find us fame and recognition within our profession,” he says. For Hirashiki, the dream materialized in the form of a forty-year career with ABC News. The uncertainty of survival loomed as the primary obstacle to fulfilling that wish. “In many ways, we all felt that we were pushing our luck every time we tried to cover a story,” Hirashiki says. He talks about correspondents who died or disappeared in the war, particularly freelancers. Hirashiki worked with many famous correspondents. The list includes Sam Donaldson, Peter Jennings, Ted Koppel (who wrote the book’s Introduction), and Drew Pearson. Without a school for combat photography, Hirashiki mastered his skills on the job. Reporters normally operated as a three-man team—photographer, sound man, and correspondent. Hirashiki tells dramatic stories that involve a long list of teammates. He frequently cites these men as teachers and heroes who taught him the finer points of journalism. His stories are interesting because Hirashiki complements his views with observations by other people who were involved in each incident. Often, this comes from post-war letters that deepen the significance of an event. The acute details of his recollections of a battle in Happy Valley and the chaos leading to the war’s end—which open and close the book—provide highly informative and enjoyable reading. Following the 1973 ceasefire in Vietnam, Hirashiki temporarily moved to Phnom Penh. He describes the Khmer Rouge assault on that city’s civilians as “scenes from hell.” This gave me the impression that this action was more horrendous than what Hirashiki had seen in Vietnam. The book’s importance lies in its neutrality. 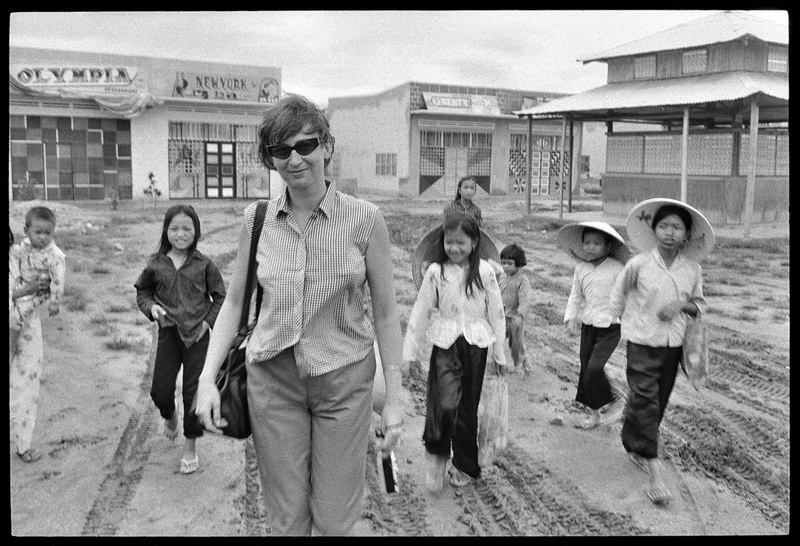 Many people have criticized Vietnam War correspondents, especially television reporters, for promoting antiwar sentiments. On the Frontlines of the Television War, which was edited by Terry Irving, contradicts that opinion by telling the story of a closely knit group of professionals who strove to report what they saw as accurately as possible. In other words, any distortion in television reporting did not originate in the field. Foreign Correspondent: A Journalist’s True Story by Patricia L. Mosure and Stephen G. Patten (Lee and Grant International, 401 pp., $17.95, paper) focuses on Patten’s experiences over a forty-year period. He served as a Captain in the Marine Corps from 1962-68, including a short tour (three weeks) in Vietnam in 1967. He then was a foreign correspondent in the Middle East, the Far East, and Central America. The authors also devote one chapter to the current war on terror. Steve Patten and co-author Mosure also recount their meeting a Catholic nun, Sister Linh, who was running an orphanage in South Vietnam. She told Patten that “if the Communists come, they will kill me.” In 1975, with the fall of South Vietnam imminent, Patten flew there to try and rescue Sister Lihn. The mission failed and he never saw her again. That incident spurred Patten’s interest in the POW-MIA issue. Several chapters are devoted to discussing the 83,120 who remain missing from World War II, the Korean and Vietnam Wars, the Cold War. and Gulf War. Especially poignant are the stories of five returned POWs: Angelo Donati (Laos), Ed DeMattos and Phil Nadler (World War II), and Paul Galanti (Vietnam). The book gives a realistic view of what life as a foreign correspondent entails. The authors’ stories include accounts of South Vietnamese refugees (the boat people) fleeing communist rule, the Plain of Jars in Laos, Pope John Paul’s visit to South Korea, guerrillas in El Salvador,and interviews with Mother Teresa and India’s Prime Minister Indira Gandhi. Several chapters are devoted to Patten’s struggle to clear his name after being fired in 1984 by CBS following allegations that he was a CIA agent. Patten worked briefly for NBC, but was fired again when the CIA rumors resurfaced. The authors suggest the CIA rumor was planted by the Israelis to discredit him because of his critical reporting of Israel’s invasion of Lebanon. The book follows Patten’s fight all the way to the CBS Board of Directors in 1990, but does not reveal if a settlement was reached. I found this book very interesting and would recommend it to anyone with an interest in war reporting, POW/MIAs, and the history of our most recent wars. In 1959 at age nineteen, U.S. Navy enlistee Paul Brinkley-Rogers fell in love with a thirty-one-year-old Japanese woman—Kaji Yukiko. Fifty-five years later, Brinkley-Rogers—who went on to become a Newsweek correspondent who covered the war in Vietnam and Cambodia for eight years—recreates that platonic relationship in Please Enjoy Your Happiness (Touchstone, 333 pp; $25.00 paper). In speaking across half a century, he tells Yukiko, “I never was awed as I was when I was close to you.” Practically every sentence in the book supports that declaration. The relationship lasted for six months while his ship—the aircraft carrier U.S.S. Shangri-La—operated out of Yokosuka, Japan. Actually they spent only forty-five days together when “the ship was anchored in your harbor,” Brinkley-Rogers writes, but they communicated by letter while he was at sea. The book contains ten of Yukiko’s letters that focus on his future. The two instantly bonded while she served as a geisha-like hostess at a bar called the White Rose. In their limited time together, she opened the doors of the arts to Rogers and provided him with guidance for a lifetime. Virtually every experience with Yukiko provided enlightenment for him. Yukiko’s education extended deep into Eastern and Western music, poetry, and cinema. Raised in Manchuria, she fled to Japan following World War II to escape the Soviets. Amid the post-war chaos, a Yakuza gangster took her as a mistress. Her ultimate release from the gangster partially involved Brinkley-Rogers. English by birth, he grew up under an estranged mother and domineering father. The family moved to the United States in his late teens. After high school, he joined the Navy to escape from home and find his identity. As a leftist thinker and with a high regard for the downtrodden, the young Navy man easily developed an appreciation for all things Japanese. More than once, he berates America for bombing Japanese cities and civilians during World War II. Yukiko integrated him into a segment of Japanese society in a manner that nullified any stigma he had as an American sailor. Many people, including a Japanese detective, found reasons for helping Brinkley-Rogers. They appeared to appreciate his exceptionally astute mind and positive nature. I strongly doubt that time might have distorted his memory of 1959 because, along with Yukiko’s letters, he frequently refers to photographs and notes from the past. After the Shangri-La completed its deployment and returned to the United States, Brinkley-Rogers and Yukiko never met again. Reading Please Enjoy Your Happiness is a cerebral exercise. The writing .imbued me with nostalgia for my late teens and early twenties. The author cited almost-forgotten poems and words from songs to emphasize the lessons Yukiko taught him. In a subtly funny way, he describes his commander and the ship’s chaplain and their close-to-fanatical zealousness to control his thinking and actions. Fundamentally, the book’s story line falls well outside the values of today’s young people, but the same observation applies to the time in which it took place. Which is what makes the book timeless and interesting. Before retiring to Arizona, Paul Brinkley-Rogers spent much of his life in the Far East as a journalist. He shared a journalism Pulitzer Prize in 2001.